Water levels: Due some rain in the mountains, the river came up a couple of inches, but it is still in a good shape. Fly lines (tips, heads, lengths, and densities): Heavy tips: T-14,T-17 and T-20 in different lengths. 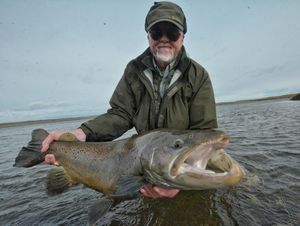 When we have to throw T´s a Skagit head is the best option. Length and strength of tippet and leaders: 3 to 10 feet, 12 to 20 pounds. Weight of the biggest fish: 22 pounds. 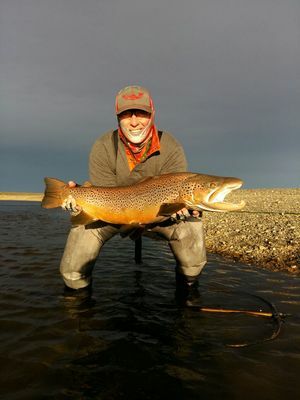 Vadim Kuprienko landed a 22 pounder and a 20 pounder. 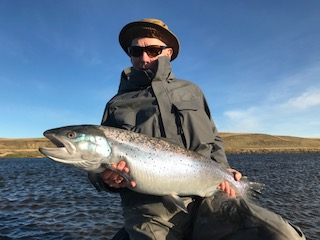 Gordon Armstrong landed a 20 pounder. Jim Brunjak landed a 20 pounder. 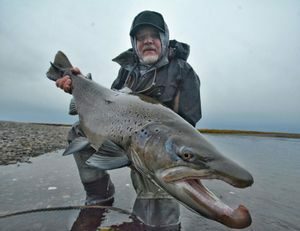 Nikolai Kirsonov landed a 20 pounder. Mike MacPherson landed a 20 pounder. 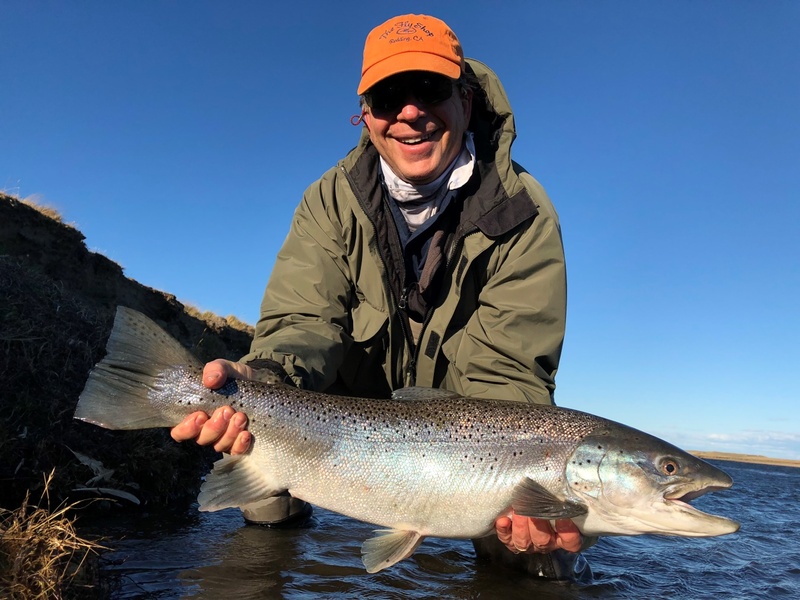 Another week at La Villa just ended with a bit tougher fishing then the week before and some days with frost in the morning, and ice in the guides. 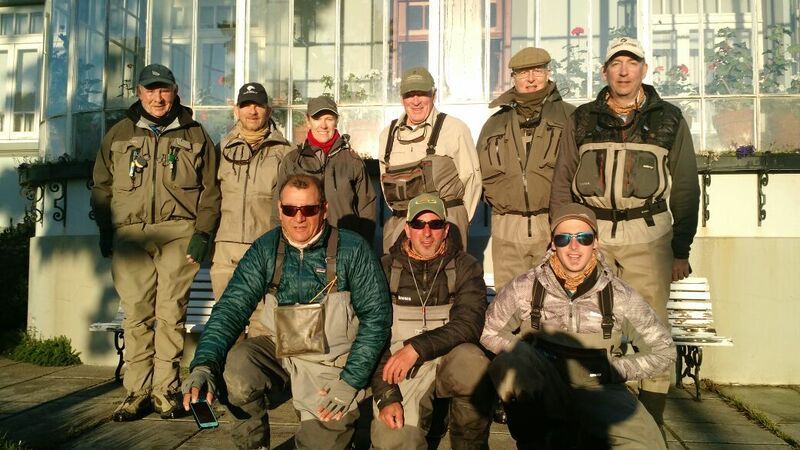 60 fish were landed, 23 fish over 15 pounds, and two over 20 pounds. Our average weight of fish landed was 11 pounds. Top rod of the week was Gary Litman with 21 fish to the net, the biggest 21 pounds. 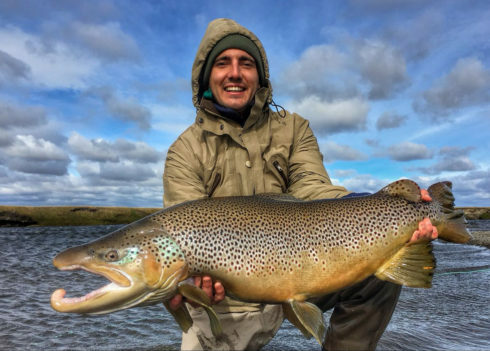 Andrew Michel landed the biggest fish of the week at 22 pounds. Water level: The River rose on Thursday, but is still clear. Wind speed range: Blew from north west like usual, and it wasn’t too strong. Weather observations: One really cold morning -4°C. Flies that are working the best: Nymphs: emb, wonder bug, prince nymph, different sizes of sunray shadows. Big flies for the last hour: big tube flies. 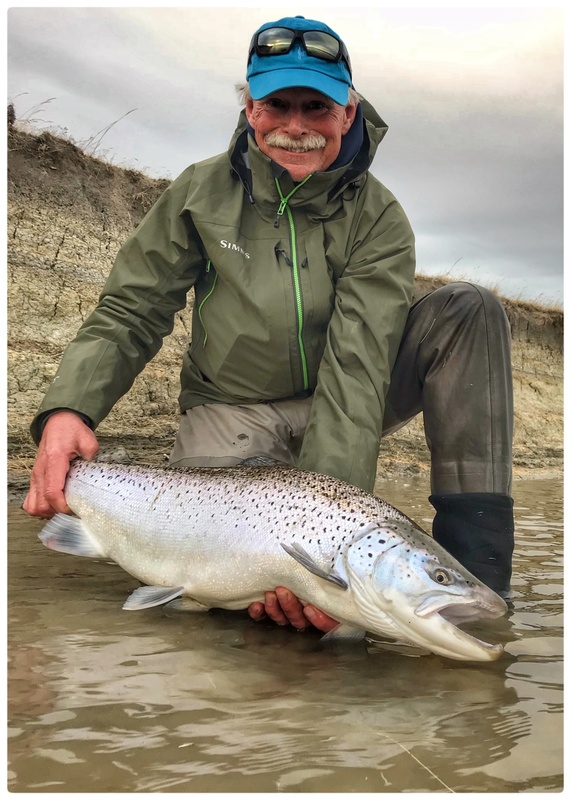 Emb’s, prince nymph were the best of the week, using sinking lines. Fly lines (tips, heads, lengths, and densities): Skagit heads with different lengths of T-17, T-14, T-11, as well as Scandi heads with poly-leaders. Floating lines didn’t work as good as last week. Length and strength of tippet and leaders: 6 to 12 feet, 12 to 16 pounds. 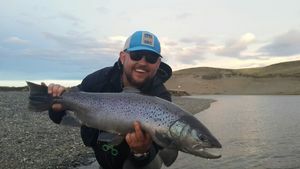 Most of the fish were in the lower and middle part of the river, upper part is really low and the pools little or no current, making fishing very difficult. 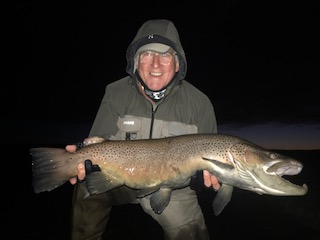 We just ended week nine on the Rio Grande with great old friends and we made new friends as always. The river came up 3 inches on Monday because of some rain and snow in the mountains but it is still in great shape, low and clear water. 110 fish landed for the week with 40 over 15 pounds, 4 of them were over 20 pounds. Top rod was Mike Bay with 14 fish to the net. Two 22 pounders were landed by Tristan Falco and Russell Graham. Water level and amount of increase or decrease through the week: River came up 3 inches during the week. It is still low and in excellent conditions. The weather changed this week and the fishing slowed a bit some days with frost in the morning. 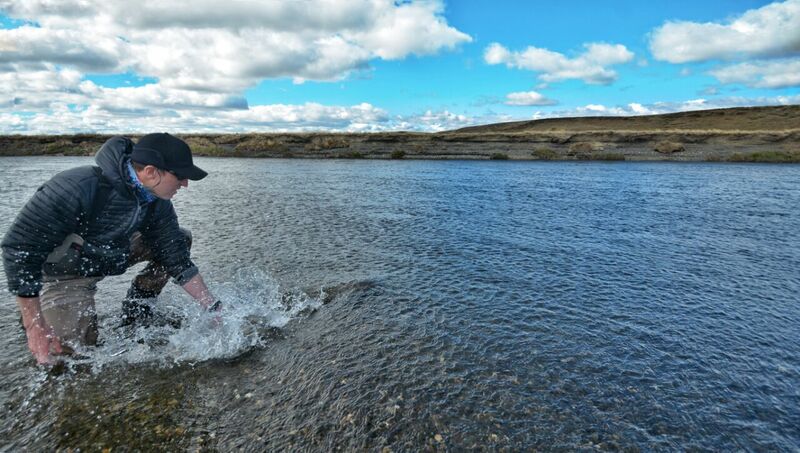 Low temperatures pushed the fish deep in the pools. 81 fish were landed, 22 fish over 15 pounds, and 2 over 20. Average weight was 9.5 pounds. Top rod of the week was Steve Elliott with 21 fish on the net, the biggest 19 pounds. 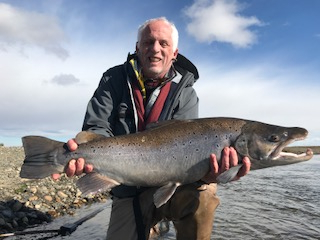 Paul senior landed the biggest fish of the week at 21 pounds. Water level: The river was getting low, but river rose on Thursday. Wind speed ranges: The wind blew from North West like usual, and was strong. Weather observations: First frost of the season. Flies: Nymphs: Emb’s, Wonder Bug, Aurelia Prince, Prince Nymph, Rubber legs nymphs. Different sizes of sunray shadows. Big flies for the last hour, big tube flies. The Wonder Bug and Emb were the best flies of the week, using sinking lines. Fly lines: Skagit heads with different lengths of T-17, T-14 and T-11, Scandis with poly-leaders. Floating lines didn’t work very good this last week. Dead drifting nymphs with sinking lines was very effective. Most of the fish were in the lower and middle sections of the river. 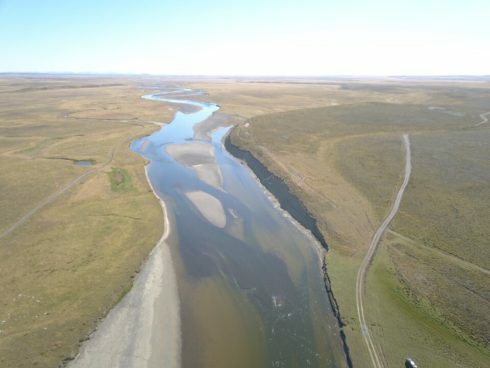 The upper part of the river didn’t fish well; the water was too low. 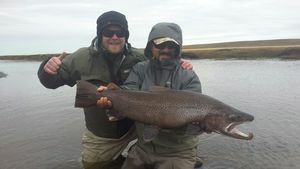 Even with the low temperatures some fish over 15 pounds were taken with floating lines on top. 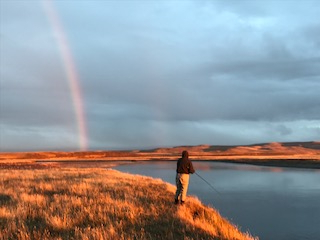 Another great week fishing the Rio Grande at Maria Behety Lodge came to an end. 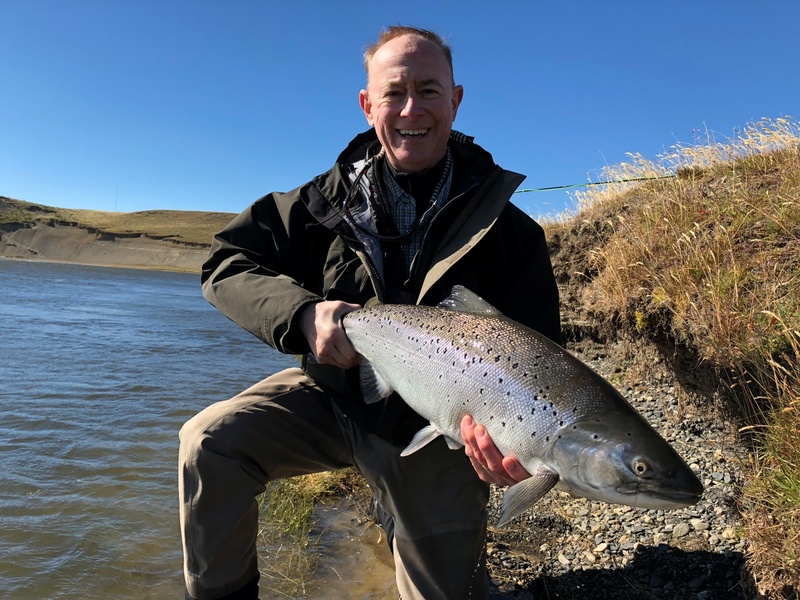 The river continues to be in good condition, low, clear water and dropping a little every day. 122 fish landed. 33 over 15 pounds, 3 of over 20 pounds. Kevin Bitmead landed the fish of the week: 21.5 pounds. Water level and amount of increase or decrease through the week: River dropped 2 inches during the week. It is low and in excellent conditions. Wind speed ranges through the week: It was windy most of the days (10 to 40 mph). On Thursday afternoon the wind went up to 55 mph! Black wooly buggers, yuk bug, tdf taxi, intruders, leeches, monkeys. We had some action on top with sunray shadows and green machines. Heavy tips. T-11, T-14, T-17 and T-20 in different lengths. To fish on top a great option are the Scandi heads. When we have to throw T´s a Skagit head is the best option. Weight of the biggest fish landed for the week: 21.5 pounds. Kevin Bitmead landed a 21.5 pounder and a 20.5 pounder. 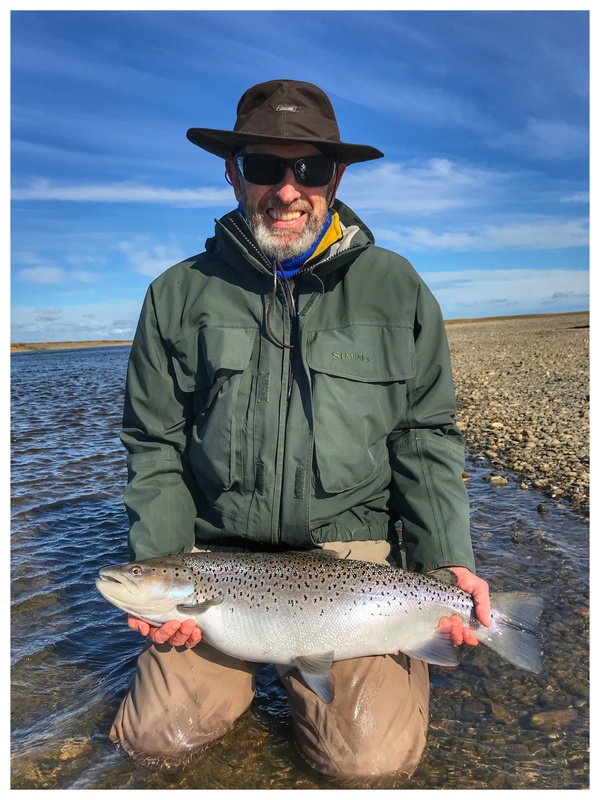 Great week, the best week of the season, 122 fish were landed, 49 fish over 15 pounds, 5 over 20, Average weight of fish landed was 10.5 pounds. 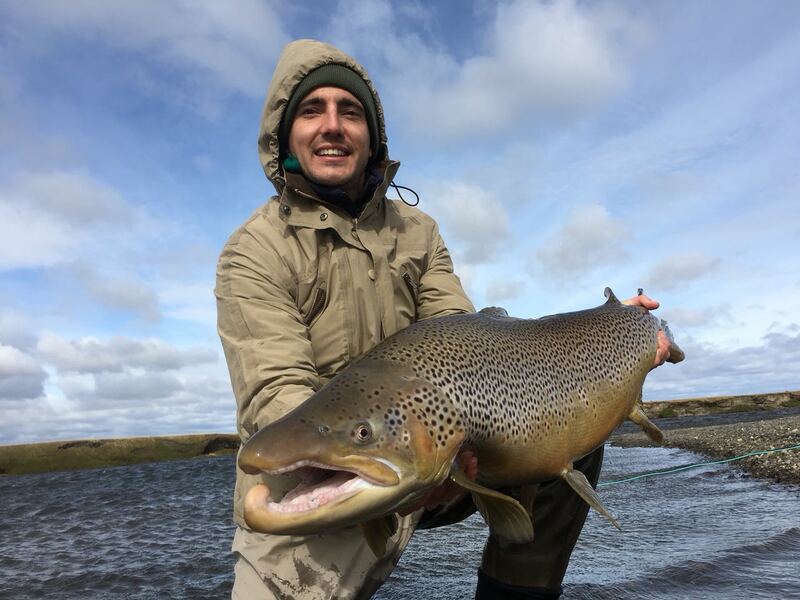 Top rod of the week at La Villa de Maria Behety was Ian and Isabel, 35 fish to the net, the biggest 20 pounds. 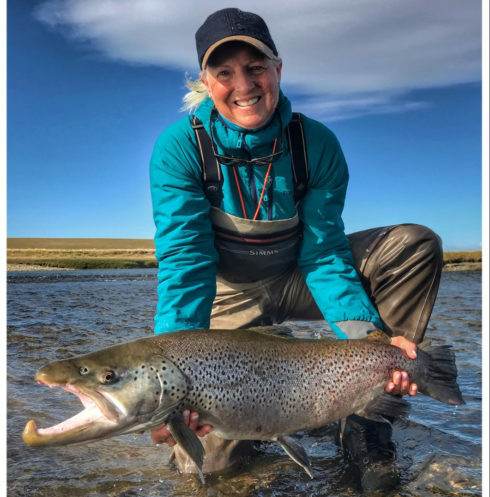 Jean Howman landed the biggest fish of the week at 23 pounds. Water level: the river is getting low. The wind blew from North West like usual, and it was strong. Weather observations: Sunny all week. Flies that are working the best: Nymphs, Emb’s, Wonder Bug, Aurelia Prince, Prince Nymph, Rubber legs nymphs. Different sizes of Sunray Shadows. Big flies for the last hour including big tube flies worked well. The Sunray Shadow and Wonder Bug were the best flies of the week, fished on sinking lines. Skagit heads with different lengths of T-17, T-14, and T-11. Scandi heads with poly-leaders worked well. Floating lines didn’t work so good this last week. Length and strength of tippet and leaders: 7 to 14 feet in length, 12 to 16 pound in strength. Most of the fish were in the lower and middle part of the river, upper part didn’t work good. 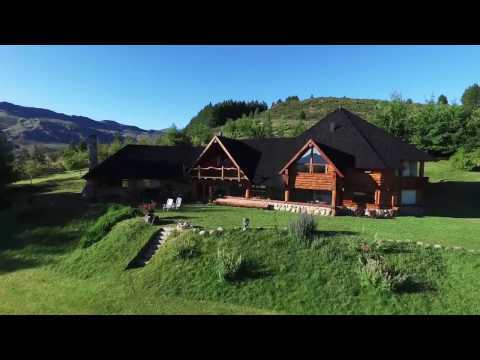 Notable catches: great fishing in Alejandro pool, 14 fish landed 10 over 15 pounds.